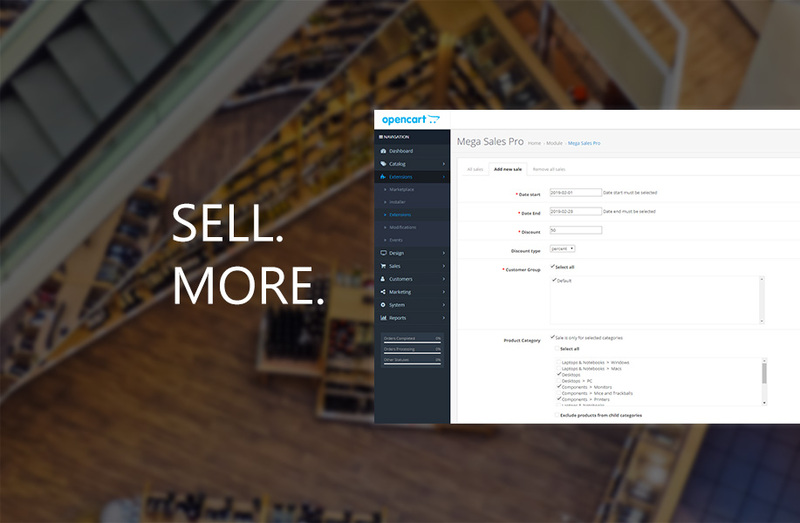 OpenCart - Mega Sales Pro - start massive sale in a click! 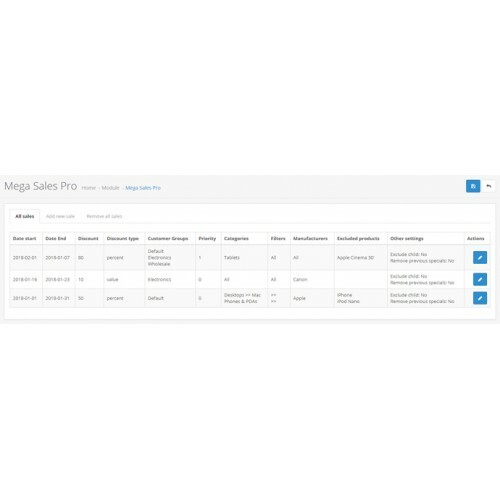 Mega Sales Pro - start massive sale in a click! Start massive sale in a click! 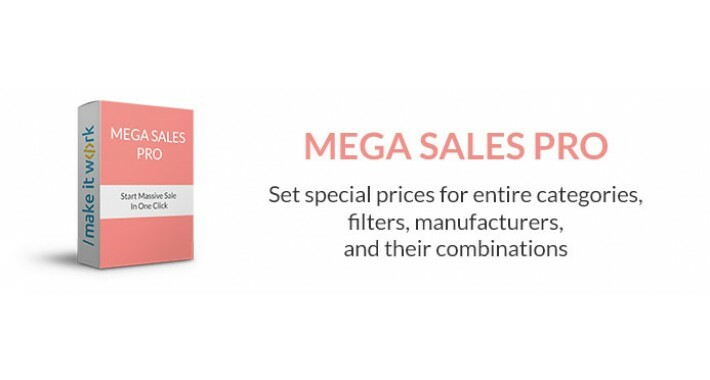 Mega Sales Pro extension allows you to set special prices for entire product categories, manufacturers, products with specific filters, and their combinations (category & filter & manufacturer & customer group combinations) in seconds. You can set specials for entire (and multiple) categories, manufacturers, products filters and their combinations. Specials can be set for one or more customer groups at a time. You can select when sale starts and ends (date), what type (percent or price off) and value discount is applied (for example - 30% off, $20 off, etc.). 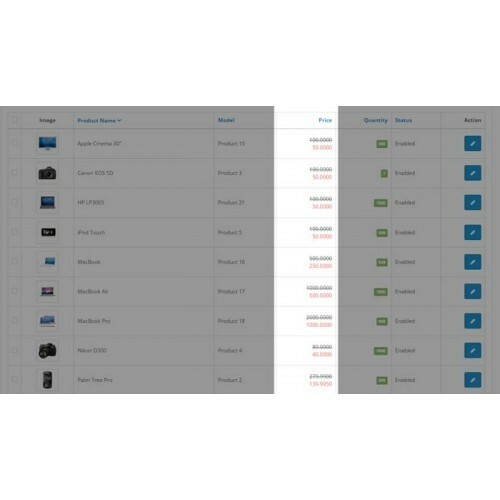 There can be unlimited different sale combinations set - you will have a list of them in extension settings page. You can remove one or more sales without affecting other. You can edit sales without affecting other. Extension does not require vqmod, ocmod or any other mod system - it is a standalone extension that does not change any other OpenCart files. 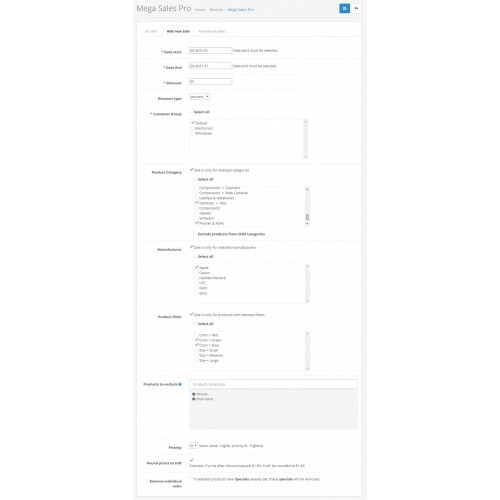 Go to Extensions >> Modules >> Mega Sales Pro to edit and view the extension. After the latest update (2018-01-08) you can select multiple customer groups, multiple categories, multiple manufacturers, multiple filters and apply all of them in one sale (and have unlimited number of sales). After the latest update (2018-01-08) you can also exclude selected products from sale. WARNING: This extension should not be used for products where product options differ in price. The discount is calculated from the main product price (like the default OpenCart product specials), not the option prices. Installation instructions and documentation is available in the download package. Excluded product list fix for OpenCart v1.5.x versions. For those who bought the older version (2016-2017 year) please check included documentation for update instructions or contact me (the author) directly at mail@imakeitwork.net if needed. Anyway, update is simple.